This Chateau White Painted Side Chair is one of the simpler chairs from our Chateau range, but that does not mean it lacks in anyway. Luckily this means that our wonderful Side Chair could fit in with any modern or traditional design. 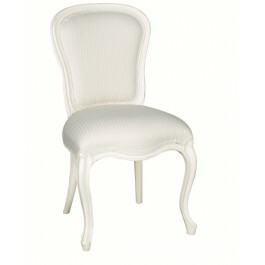 The Chateau Side Chair oozes elegance and French style! White Painted, lightly distressed and the fabulous striped upholstery on the seat and the back give this Chateau Side Chair not only style and character but comfort too! If you are looking to change your interior design but dont want a complete makeover this Chateau White Painted Side Chair is perfect as it can transform any living space. Whether that is in your hallway to welcome your guests, your living room for extra seating or even in your bedroom to use at your dressing table this perfect Chateau Side Chair has everything to offer!